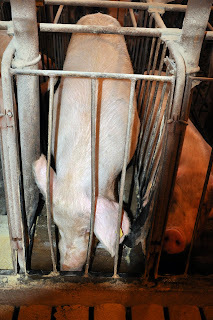 We use gestation crates! Crates are individual stalls that allow us to provide each sow with individual attention, nutrition, and observation, and reduce competition and injury from aggressive sows. EATING and licking the trough clean, her feed is still there. We run the feed lines in the gestation barn twice a day - morning and evening - and in between we run water thru the trough so they always have constant access to fresh water. 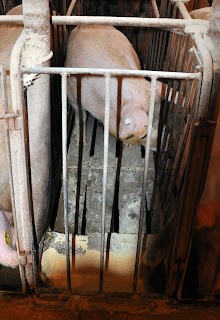 Now if this sow had not been in a gestation crate but in an open pen with other sows we may not of noticed that she wasn't feeling well - especially based on the fact that she left feed because the other sows in her pen would of gladly eaten her share that she left. So we gave a shot of Flu nix (anti-inflammatory) and some penicillin. When we check on her a little later she was up and eating! 1. My feed is still here and now I can eat it all! b) I am glad to have my space when I am not feeling well - I can lay down and the other sows aren't bugging me, laying on me or nosing me! Just sayin' that's what I would be thinkin'! Now I know you are waiting for the Bad And The Ugly - but there aren't any just ask that sow who is now on her way to feeling better! Agree 100%. If I am pregnant and all my girlfriends are pregnant at the same time, please keep us seperated! Excellent description of gestation crates and the good that can come from them for a mama pig. I agree with Leah I would not be doing well with my pregnant girlfriends all in the same pen. I'm a new follower and am definitely adding you to my list of favorite farm and food blogs! Great explanation! I wouldn't want other people bugging me and eating my food even if I didn't feel good! 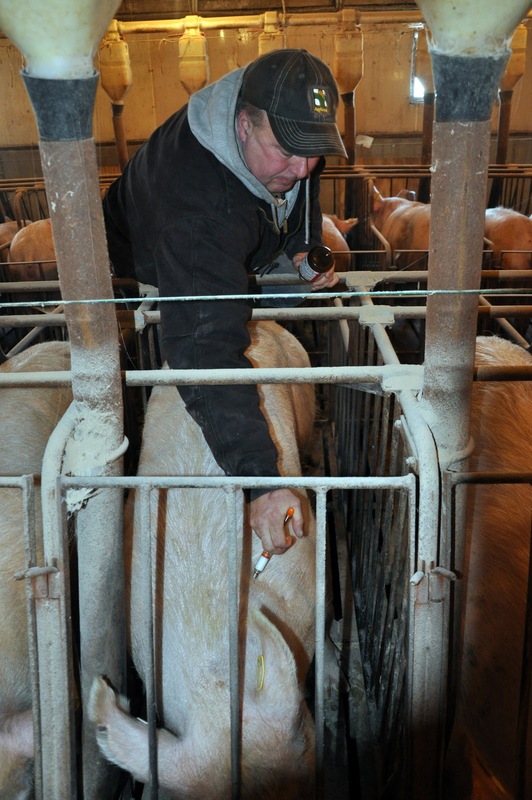 It's amazing to me how in tuned farmers are with the health and well being of their animals. 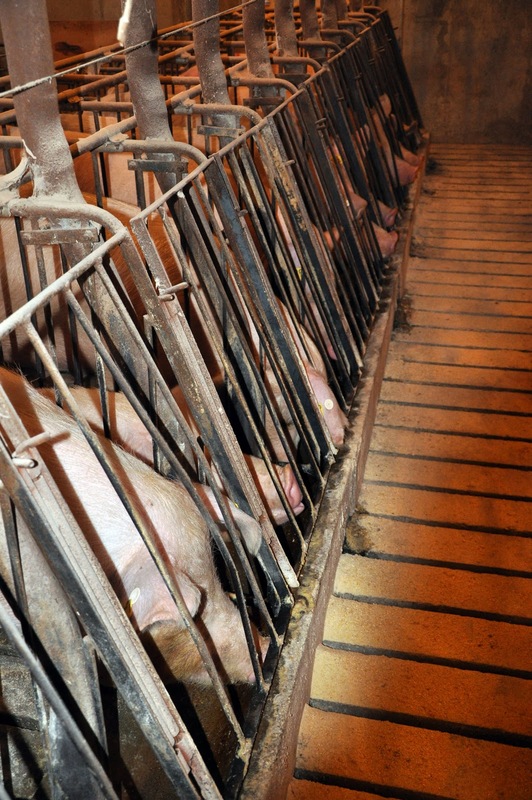 Yes seeing that feed isn't eaten may seem simple, but you have to care about them and be tuned in to notice and treat. Looking forward to meeting you soon. Enjoying my chats here at Blissdom with Cris! I'm a little late to the party, but GREAT job at a simple explanation of why we do what we do!